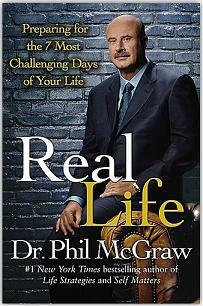 In Real Life: Preparing for the 7 Worst Days of Your Life, bestselling author and talk show host Dr. Phil McGraw is here to help you prepare to confront what he believes are the seven most common critical days that you or a loved one are likely to face. This book helps make it possible for you to be there for yourself or to be the calm in the middle of the storm for someone you love when any of these difficult days arrive. Loss --the day that you or someone you love has their heart shattered by death, divorce, or losing something of great value. Fear --the day that you realize you have lived your life as a sellout and that every choice you have made up until this point was dictated by other people's expectations, not based on your own goals and desires. Adaptability Breakdown--the day that the pressures of balancing your responsibilities and needs, along with life's demands, have become way too overwhelming, and you realize that you are in way over your head. Physical Health-- the day that your body or that of someone you love breaks down because of illness, trauma, or disease. Mental Health-- the day that the mind breaks down and betrays you or someone you love. Addiction-- the day that addiction takes over, and you or your loved one look a powerful destroyer in the face and realize that you are not in control. Existential Crisis-- the day that you or someone you love lose the purpose, compass, and connection to meaning in life and have no answer to the question "Why?" Encountering these days can feel like hitting a brick wall. But while they will change your life, they do not have to ruin it. Dr. Phil's step-by-step plan for getting through the worst days is designed to help you feel prepared when it really matters -- in the midst of a crisis. Dr. Phil provides wisdom and resources that will guide you toward a solution that is right for you, showing you how to minimize disruption and maximize the recovery. This book is not just about giving you a crisis-mode plan. It will also show you how to change your life now, before you get into a crisis, so that you are not behind the power curve when any of the seven days hit. You will be able to be a leader to someone you love during their crisis because you will know what to do. Dr. Phil says there are no exceptions: with the right attitude and the right information, every worst day can be turned into a valuable life experience.